Time for another month of What's In The Box! 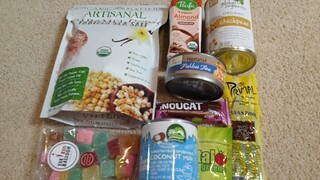 The Cruelty Free Shop Vegan Mystery Box, that is. Nature's Charm Condensed Coconut Milk: This will be gifted on, as I don't like condensed milk and I am pretty sure I like it even less when it is coconut fatty. Global Organics Chickpeas: Chickpeas never go astray. This month's box came with a recipe for aquafaba lemon meringe pie and a recipe for hummus, so they were going for a cute theme here. Organic Matters Vanilla Sea Salt Caramel Popcorn: I am not a popcorn fan, I am not a caramel fan, especially not when it is popped with coconut oil. So why can't I stop eating these? Only in small doses so the coconut oil and caramel doesn't do me in. But it is very tasty and very snackable. I just wish it had a bit more salt! Pacific Foods Chocolate Almond Milk: I love flavourite milk. I have had their chocolate hazelnut milk (OMG, so good), but not the almond one before. Curious to see if it leaves me with saw dust tongue like almond milk so often does. The Red Balloon Vegan Jellies: Yes!!!! This is a major score. I was lucky enough to win some of these jellies in a competition last year, and they are seriously good. I am not a big lolly person, but I make an exception for these. Pretty stoked. Vital Greens Mini Sachet: Will meet a morning green smoothie at some point. Bonvita Nougat Bars: I haven't had one of these for ages, but I used to love them. Plus Bonvita is on the Food Empowerment Project's approved chocolate list, so it is a win all around. Caroline's Vegetarian Tuna: In 2015 I experienced some of the Sophie's Kitchen tinned vegan tuna and it was... revolting? I threw it out. I am approaching this with extreme caution and skepticism. Texas BBQ Jerky Primal Strip: I love these, and this is my favourite flavour. Though I wish they would sort out their packaging so that you could actually open them, those little strips to tear off are useless. Anyway, pretty happy with this box. The highs and lows. Sahara was pretty knocked around by her first couple of weeks of chemo. My poor bear. On Wednesday she had her third week of treatment. Before this, she had an ultrasound to recheck the mass in her colon. The good news is that the mass is gone, she is in complete remission! Now, I do have to note that complete remission is not the same as a cure. It means the chemo is working, and so we get more time together. Anyway, a happy moment. However, on Sunday I noticed a lump that had suddenly come up. A needle aspirate was sent to the lab, and it came back as probably sarcoma, which is another type of goddamn cancer. So on Tuesday she has to go in for surgery to remove it, which will also set the chemo for her lymphoma back a week. A very unhappy moment. I'm a month behind with this, but here is my Christmas round up. But first, a quick Sahara update again. After my last post, she took a turn. 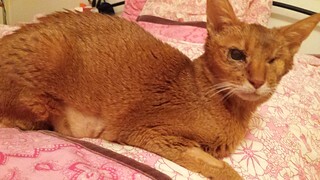 Three days after chemo she suddenly became very unwell. A day of drugs and nursing improved her a little, but she was clearly dehydrated and unhappy. I took her back into the clinic on Sunday to admit her for IV fluids. Thankfully she responded really well and I was able to take her home on Monday. She has been a lot better since. Though I just gave her the week two chemo dose (a tablet she gets at home, so a different drug from last week), so who knows what the next week holds for us. Things I am learning: it is literally day by day, be happy when she is happy and be ready to give her the support she needs when she is not. OK, so Christmas. This year was a special year because my brother was home from the UK for a few months, so this was the first Christmas we got to spend together as a whole family in several years. Christmas is always tinged with sadness for me, due to Gizmo memories and loss, so it was nice to have him here. The last few years I have skipped the big Christmas morning breakfast and started my day with a 90 minute bikram yoga class, followed by a green smoothie. I am that person now. This year's smoothie was the Ginger Colada Green Smoothie from the Minimalist Baker's Everyday Cooking cookbook by Dana Shultz. 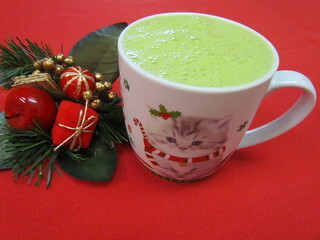 I generally like a gingery smoothie because it seems festive. This one had ginger, lemon, coconut milk, pineapple, banana and greens. I decreased the amount of coconut milk and made up the rest with oat milk due to my sensitivities, and I used only spinach rather than a blend with kale. It was a refreshing smoothie, and fairly creamy, but I did find it a touch too acidic. Behold my festive mug that I served it in. After breakfast we did presents. I got some new cookbooks (Baconish and But My Family Would Never Go Vegan), some Buffy Season 10 and Angel & Faith comic volumes, the final season of Parks & Rec on DVD, and a Music for Cats CD (that is actually incredibly soothing for my own stress and anxiety levels). So a decent haul. After presents it was time to start making lunch, which is our main meal of the day. 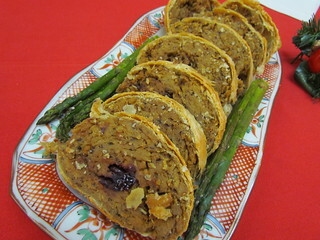 For the centerpiece this year, I had found a Field Roast Hazelnut Cranberry Roast En Croute. 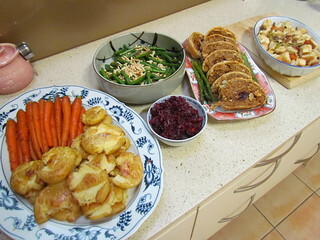 It was pretty tasty, and definitely one of the better Christmas roasts I have tried. I like the puffed pastry and the filling. The roast itself is made with the apple sage style sausage meat, which is my favourite flavour. So all round a very good roast. Seen here with some roasted asparagus. 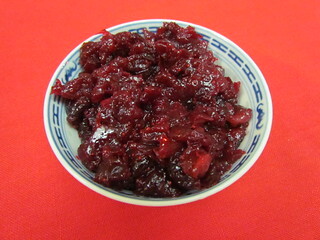 Of course, you cannot have roast without cranberry sauce. 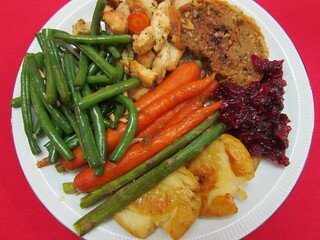 My favourite recipe from this is the Cinnamon Citrus Cranberry Sauce from Keep It Vegan by Aine Carlin. This is the second year I have made it and it is excellent. 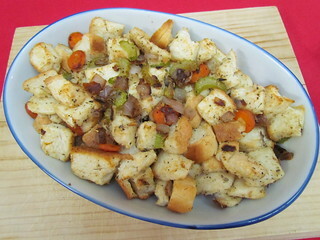 I also tried the Super Traditional Stuffing from The Superfun Times Vegan Holiday Cookbook by Isa Chandra Moskowitz. I only made a third of the amount, because the full recipe is huge. Unfortunately my bread was sliced a bit too small I think (I bought it from a bakery and they said they would slice it thick for me to make the stuffing with, but their thickest slice was really not that thick), so it was a bit soggy. The flavour was good, but I would have liked a higher veggie to bread ratio. Finally, some greens. As greens are important. 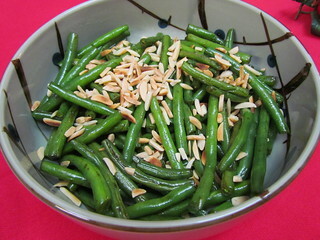 These are just some seared green beans with toasted almonds. With four of us a the table, we served the food buffet style in the kitchen, and loaded up our plates. After lunch, we had some vegan Christmas pudding that we got from the Cruelty Free Shop. It was nice. Served with custard, of course (Alpro vegan custard). 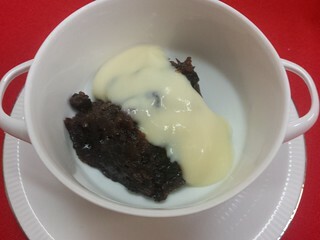 The first photo here is so you can see the pudding, with a custard drizzle. 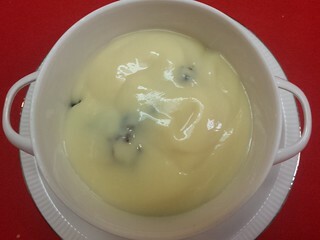 The second photo shows you my optimum custard to pudding ratio. Then we played some fun card games (Sushi Go and Timelines Inventions), before lazing about for the afternoon and picking at leftovers for dinner. The following day we played our traditional game of kids vs adults Trivial Pursuit, which we can only play if Greg is here. It was a very long, close game, ultimately the parents won. I'd forgotten how long Trivial Pursuit can go for, next time we need a speed version. I had a few days off after Christmas as well, and this time of year sees me eating lots of treats I associate with Christmas. So here a few other things that I had over the next few days. 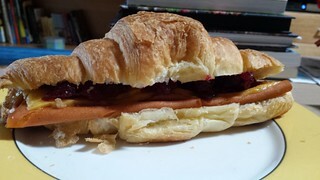 A croissant with Tofurkey Ham, Tofutti cheese slices and leftover cranberry sauce. The croissant is from a local company, but unfortunately they aren't great. 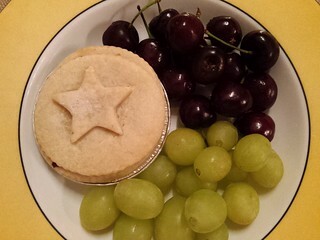 Fruit mince tart with cherries and grapes. 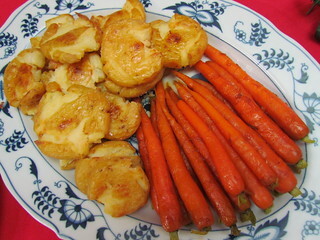 I ate this while watching the Doctor Who Christmas Special on Boxing Day. 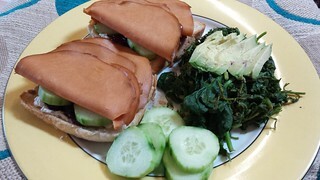 Open-faced sandwiches with Tofutti French Onion cream cheese, beetroot relish, Tofurkey ham slices and cucumber. Served with some sauteed greens and addition cucumber because I really needed some greens at this point. 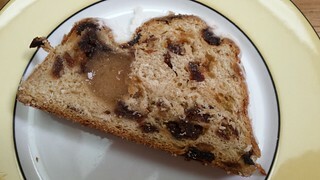 Some vegan Stollen I got from Aldi. I love stollen, and this was the first I have had since I went vegan! It was really nice. 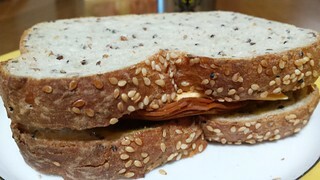 A Tofurkey ham, Tofutti cheese slice and sweet mustard pickle sandwich. 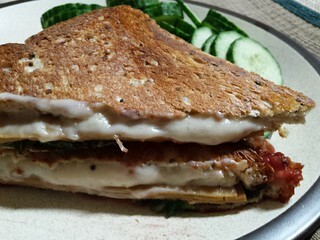 A hot and melty toasted sandwich with Daiya swiss slices, Tofurky hickory smoked slices, beetroot relish and Tofutti French Onion cream cheese. This was my favourite creation. 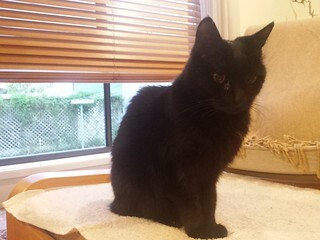 Before yoga on Christmas morning Dim Sim and I had a lovely quiet time together, with pats and purrs. 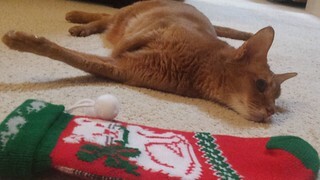 I got them some catnip spray and sprayed their stocking with it as a test. Sahara was interested.